Taylor Mead in Lonesome Cowboys: "It's the weekend and its my time to be stoned." 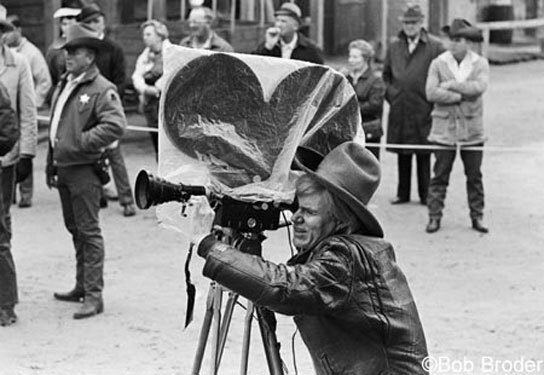 Andy Warhol's Lonesome Cowboys is probably one of the best documented productions of Warhol's films of the sixties. 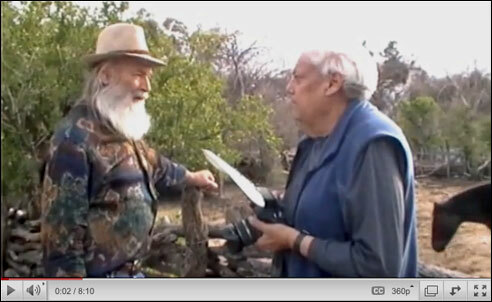 In addition to the accounts of the filming provided by the superstars who were in the movie, we also have the account of art writer (and later, Warhol biographer) David Bourdon who accompanied Warhol and his troupe of actors to Arizona where the movie was made. According to Joe Dallesandro's biographer, Michael Ferguson, Bourdon "was along for the trip on an assignment for Life [magazine]." (JOE53) In addition to those accounts, there are also the censored but informative reports provided by the F.B.I. who investigated the film. 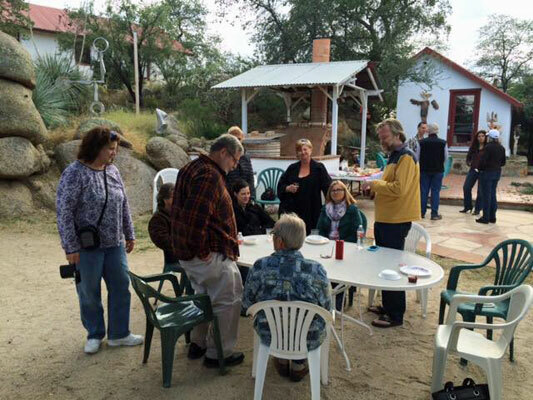 During the filming, Warhol and his entourage stayed at the Rancho Linda Vista Guest Ranch where much of the film was shot - an arts community that still exists today. Their Facebook page is here. Friday was the only day they shot at Old Tucson - 12 miles west of downtown Tucson. The rest of the time they shot at Rancho Linda Vista. 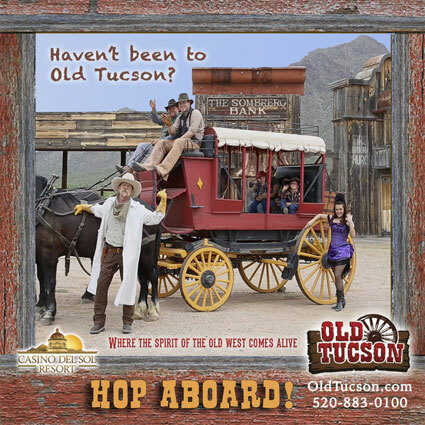 Old Tucson still exists as a tourist attraction and is still used for shooting movies and television shows. Their website is here. After filming at Old Tucson, Warhol's group gave a press conference at the Tucson Press Club. Warhol's group drove directly from Old Tucson to the Tucson Press Club, where Morrissey and Viva fielded most of the questions at a cocktail conference. "This is our two-hundredth film without a script," Morrissey said. "Oh, there's never a script," Viva added. "we write it afterward from the sound track... Men seem to have trouble doing these nonscript things. It's a natural for women and fags - they ramble on. But straight men can't." 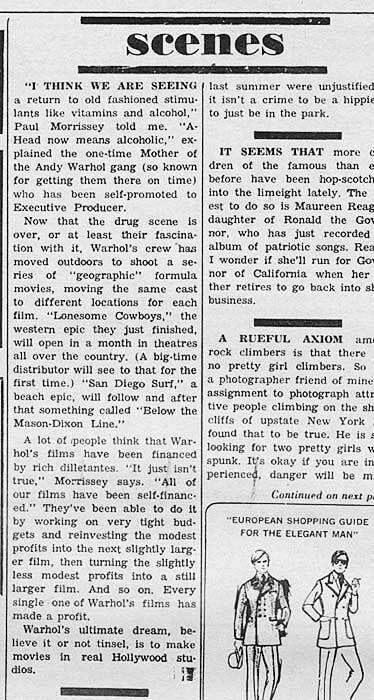 According to Popism, Warhol edited the Lonesome Cowboys footage at home while recuperating from being shot by Valerie Solanas on 3 June 1968. 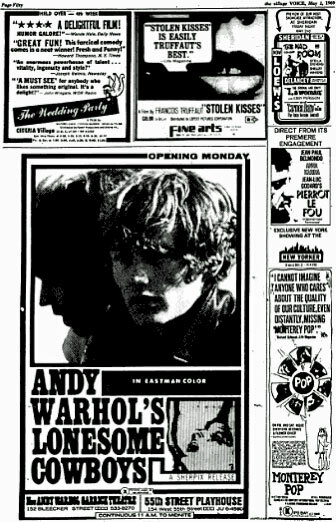 (POP284) Warhol left hospital in late July 1968, but Paul Morrissey had claimed in an article that appeared in the 18 April 1968 Village Voice that the film would "open in a month in theatres all over the country." Despite Morrissey's claim of being the director of the film, the Village Voice article identifies him as "self-promoted to Executive Producer." He was also credited as the Executive Producer in the New York Times review of the film (below). Sherpix became known mostly as a distributor of counter-culture adult or horror films until ceasing operations on 1 March 1974. Films distributed by Sherpix included the gay films Meatrack (1970) and Pink Narcissus (1971). Vincent Canby reviewed Lonesome Cowboys for the New York Times, referring to it as a "unidrama" that "isn't so much homosexual as adolescent."